OK, first let’s clarify, apparently my numbers are off, I’m listing this as episode 5, because I saw the Pilot as one full ep, whereas according the episode listings it’s 6. Justice seems to be at the heart of this week’s episode as one of the stories really seems to embrace the stagecoach feel of the old west. Amanda (Julie Benz) and Nolan (Grant Bowler) are on their way west via the Overland Transport on a two-fold mission, to deliver the town’s money that will finance a railroad connection being built for Defiance, and to deliver Rynn (Tiio Horn) the Iratient from Devil In The Dark to Vegas Prison. They don’t get very far before things go sideways, and things go bad for our heroes. Back in town, things aren’t going much better for Irisa (Stephanie Leonidas) as she spots, and recognizes an Irathient, who she believes was responsible for abuse she suffered as a child, including a snake that was used to bite her, all for a ‘religious’ purpose. Snagging him, she sets out to torture him, and even shackles Tommy (Dewshane Williams) when he tries to interfere. We hear, once again, that Irisa is supposed to be a ‘Chosen One.’ Poor kid. We also get to see Nolan’s rescue of her, and their first meeting. I also like to see that we’re still learning more about the world, there’s a discussion of polygamy, as one of the fellow coach travellers, Ambassador Olfin (Jane McLean) has two husbands. Amanda reveals she’s thought about the idea, and it seems to be an accepted practice. Nolan jests that he has enough problems keeping one relationship going. I like the relaxed stagecoach feel of this episode, and love the interplay with Rynn, as well as the double-crosses that occur. It’s just good fun, and exactly what you would expect – in a good way. It also shows that there is justice, Rynn helps out, even after she has a chance to escape and disappear. Both Amanda and Nolan get to be badasses as they take down the baddies! In payment for all that he’s done to her, she chooses the most fitting of all forms of justice, and I thought it was great. It made me happy for them. Other stuff we got to see in this episode is that Alak Tarr (Jesse Rath) hosts Raider Radio from the top of the arch, and routes the music through the town. That’s kind of cool. We got to see a little bit with Tirra (Brittany Allen), who seems to be doing ok after last week’s travails. Dr. Yewll (Trenna Keating) gets a mention but we don’t get to see her. I continue to love the world that is being revealed to us, the sweeping cast of characters, and hope that each of them gets stories and revelations. 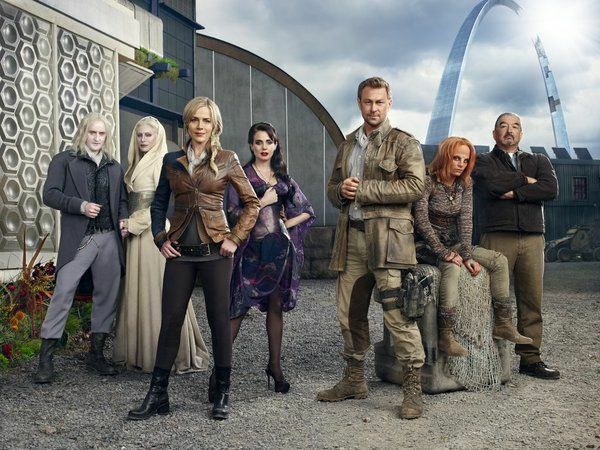 Defiance, which is very much a fave of mine, airs Mondays on Showcase!